- signatures don't seem to be read from the PC file to the app. The app leaves a blank picture icon with a green plus sign to add a signature. I'm afraid to try syncing the database from the app to the PC for fear that it may wipe out the signatures that I currently have on the PC, so I haven't tested if the data transfers in that direction. I have been syncing via dropbox using a Diving Log database and from my experience with the WP app, I know that all of this info does transfer over from the PC. While I'm confident that the database being exported to dropbox from the PC has all of the info in it, I am not so sure that the app is using it correctly. Has this info not importing been reported before and is it "normal"? If I add dives that are started in the app, will importing the database file back into the PC wipe out the existing signatures and/or diver info? Thank you for the feedback! I know, the (divelog) app situation on Android is currently far from perfect. The biggest problem is, that all Android apps are using a different logbook format. 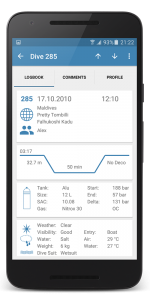 Dive Mate has not the exact same logbook format, so there are things that can't be transferred from Diving Log to DiveMate. DiveMate stores signatures in a different way (as image), while Diving Log stores is like a vector graphic (stroke coordinates). Syncing is done completely in DiveMate and I have no insights how it is implemented. I don't think you're losing data when you sync from the phone to the PC, but a backup is a good idea before you try that. In Diving Log, I store the full logbook file in SQLite format in the Dropbox. So if you have questions about the sync process, please contact the Android developer. I wish I could easily port the Windows Phone app to Android. I've already tried a few things, but it was always a huge pain for me to get started on Android. The bridges are meant to convert from other platforms to Windows, so it's unfortunately the wrong direction. One possible solution for me would be Xamarin, but the pricing is too high at the moment. I have some hopes that Microsoft either buy them or that it will be possible to easily run Windows apps on Android. Maybe this is a step to MS making the tools affordable (or free). Yes, that's definitely great news! If you need beta testers, let me know. Not a much of a programming guy (bit of FORTRAN in college and can muddle through Visual Basic in Excel sheets), but I can use an app.